David Schaeffer recently returned from a climbing expedition to Mount Cho Oyu in the Himalayas, the sixth tallest mountain in the world. An avid climber, David used his recent expedition to raise money for an endowment fund called “Highest Heights” that was created to help the Atlanta Bar Association’s summer law internship program. The purpose of the internship program is to help alumni achieve their goals of becoming lawyers. Inspired to contribute to Highest Height’s ambitious goal of raising $100,000, David proposed a fundraiser idea to S. Wade Malone of Nelson Mullins Riley & Scarborough, who helps run the program and established its fund. David’s idea was to ask the legal community to support his cause by pledging one cent for every foot of Cho Oyu’s elevation (26,906 feet) he completed. David returned to Atlanta a couple weeks ago. He had to unexpectedly turn around at just under 21,300 feet on the steep snow slopes above Camp One (21,000 feet altitude) after climbing up from the Chinese Base Camp at 16,100 feet, an Intermediate Camp at 17,700 feet, and an Advanced Base Camp at 18,750 feet. But to put his final accomplishment into perspective, David climbed more than 1,000 feet higher than the top of Denali, the highest mountain in North America. As a result of the fundraiser, 70 donors have contributed almost $15,000 to Highest Heights. The donation amounts have ranged from $213 (consistent with David’s final distance) on up. It is not too late to pledge $213 (or any amount) to help support the program. For more information contact Denisha Wise at the Atlanta Bar Association: 404-537-4932 or dwise@atlantabar.org. 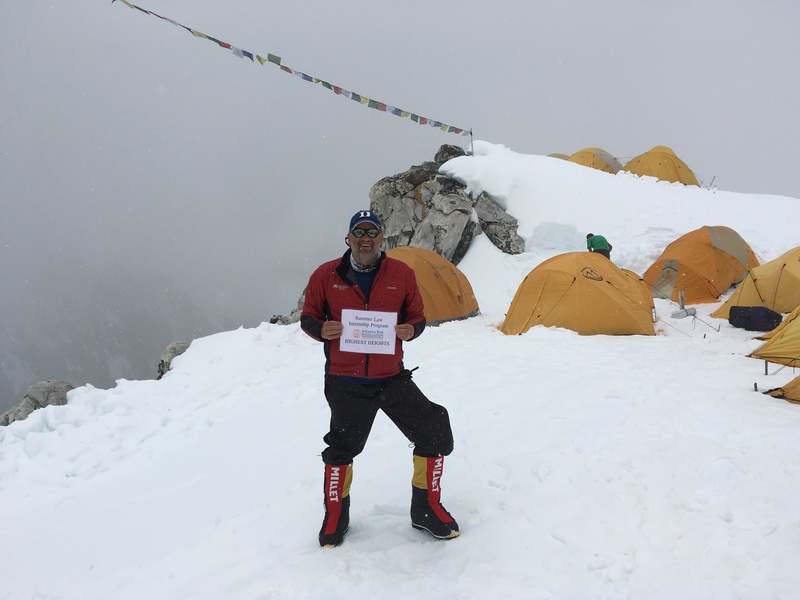 David has successfully climbed some of the highest mountains in the world. And despite how grueling and unforgiving extreme mountain climbing can be on one’s physical and mental being, David treks on in pursuit of higher heights (his next climb is to the Alps) and noble causes. Everyone at Miles applauds his efforts and that of the Atlanta Bar Association. We are proud to be associated with such a charitable organization and honored to have such a compassionate and hard-working individual as David on our panel.